In making the violin I will be working with tolerances of tenths of a millimetre or less. Go ahead and take out 2 credit cards and stack them on top of each other. 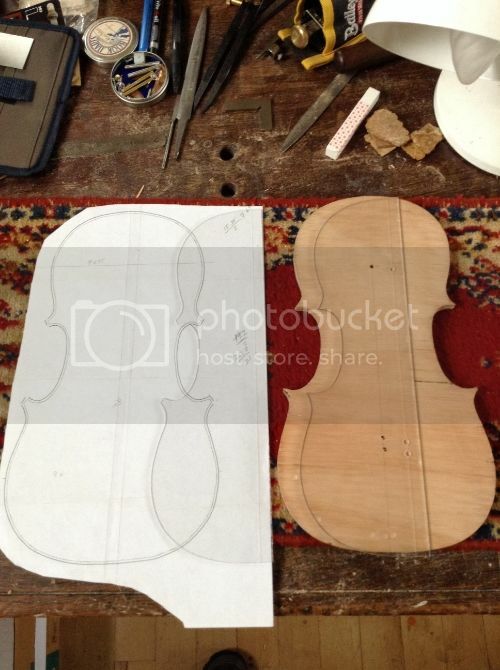 This is the average thickness of the top and back plates of most violins. The ribs are Even less than one credit card! But a violin is made Up of more than 60 pieces of wood and from the inside out and so lets get to the heart of the matter. Before one line is cut or one line is even drawn, I needed to ask myself a few basic questions which will determine how I will start. Will I be using my own design? Will I be buying a ready-made pattern? How accurate is that pattern? Sometimes, you will be able to get your dimensions from a plaster cast. Like the one in the picture, below, which I made on my first day in the shop. Or, if you are like me, you will be lucky enough to be taking the measurements And profiles directly from the violin, a 7/8ths Amati violin. In making the plaster casts, I first had to clean and scrape anything that through the profile of the top/back off of the existing mould. Next I warmed the mould with a hair dryer so that the Vaseline would melt. The Vaseline will help when it comes time to remove my mould. 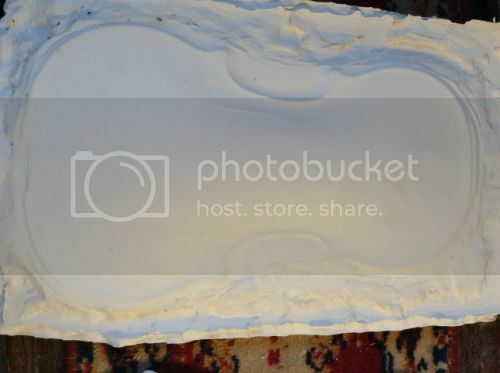 I next made a cardboard boarder, sealed any spaces, and poured in the plaster. One day later I was able to remove my mould and set it aside to dry for a week or two. When it comes to sharpening a chisel there are two cardinal rules: first flatten the back edge of the chisel and second never lift your right (or left hand if you are left handed)as this will result in an edge which will also be rounded and this will of course throw everything you want flat to be rounded. Not good. The trouble is that if you are right/left handed that is the hand which wants to lift that chisel. Which is why it takes so long to learn how to sharpen at the beginning. When John asked me which side of the drawing did I want to use as my standard design. I choose the base side and John agreed. I then transferred half the pattern, including the center line, by poking a series of holes through the paper and into the pexiglass. John made sure that I filed just past the marks. If I had of kept the line on on each successive transfer I would have ended up with a viola by the end of 6 months. Just kidding, but it certainly would not have been the size I had wanted. As it was, in most areas I was bang on but there were a couple of stubborn areas. This template helped give me the dimensions and shape for the inside template. This will be exactly 2.5 mm inside the first template. I began to see why it was important which side of the line you file down to. The mould is the piece of flat wood usually 12 mm thick that is used to keep the corner and end blocks, perfectly at 90 degrees, while you (I) glue the ribs in place. The mould will eventually be removed. 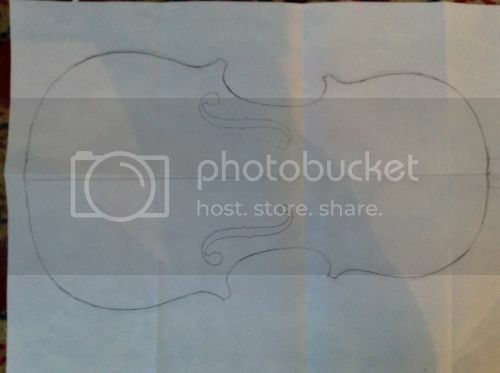 However, ...... if I make a mistake in the making of the mould, such as not having the sides perfectly at 90 degrees, then this will throughout the entire shape of the violin, no matter how careful I am (will be) every where else. We getting closer to the fun part, Of actually working on the violin, but first I have to get past filing and sanding those sides of the mould. And if it is one thing I do not like to do is sanding. Which is why it took me a day and a half. Holes still need to be drilled along the edge of the mould and then cutting out the spaces for the four corner and two end blocks Will complete the making of the mould. John's comment on the mould, "Well done, your work is now spot on. What you unto next?" Next week I'll be working on shaping the corner blocks, making the ribs, and perhaps even begin working on the neck. Cool. If you are in the market for a violin be sure to look at the side of the nut. If its corners blends into the fingerboard and the peg box, nicely, chances are good the luthier has also paid attention to most of other finer details as well. Thanks for pulling up a chair, sharing a cup of tea, and I will see you all in a couple of weeks. Is the plexiglass piece your actual template? Thanks for asking the question. Yes, the two pexiglass cut outs are the templates. However, it is as true that the initial drawing and the mould could be seen as a template. 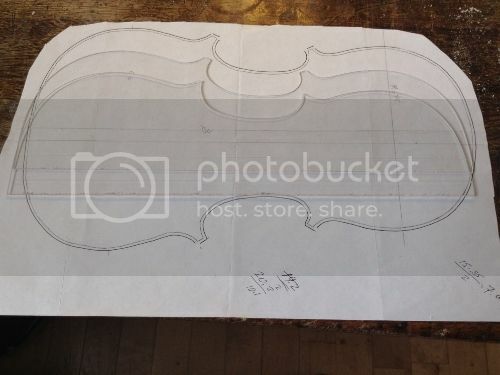 Your drawing gives the outer template, then inner template, the mould, the ribs, the plates, and lastly the purling. So everything you do will directly directly impacts on the finished violin. You'll see that as the process developed.